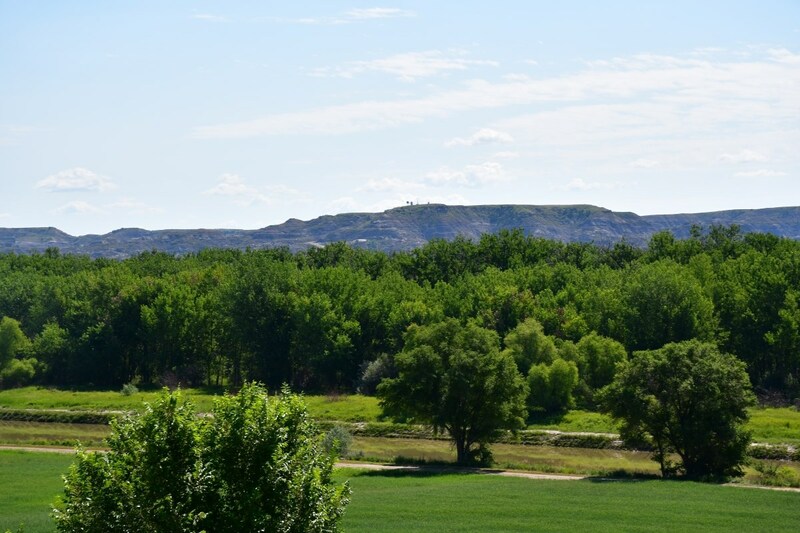 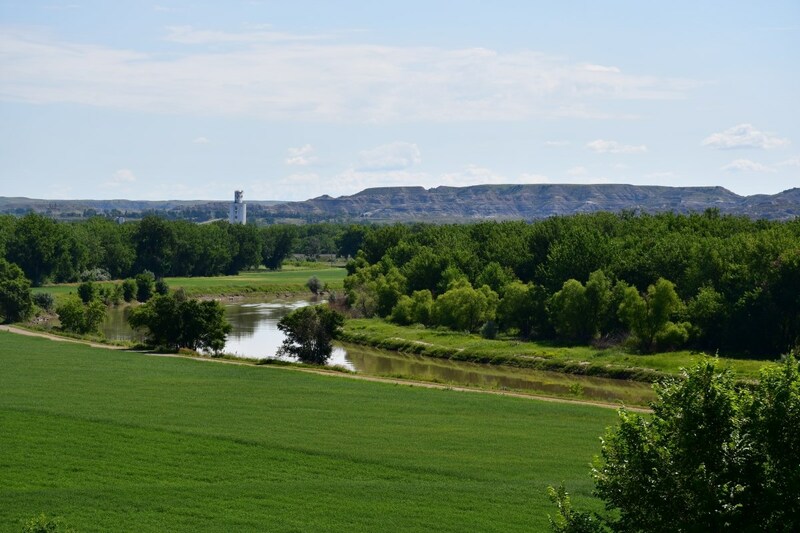 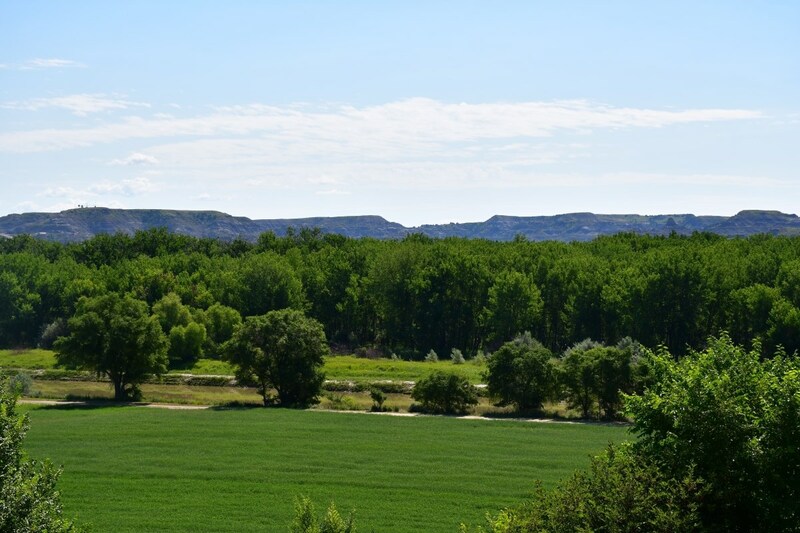 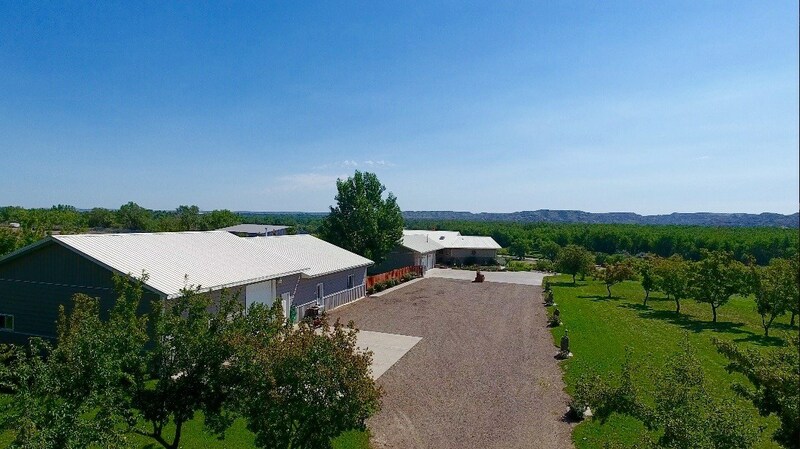 Being offered for sale is this one of a kind 3,888 sq' home overlooking the Yellowstone River with views of the Badlands and night lights of Glendive. 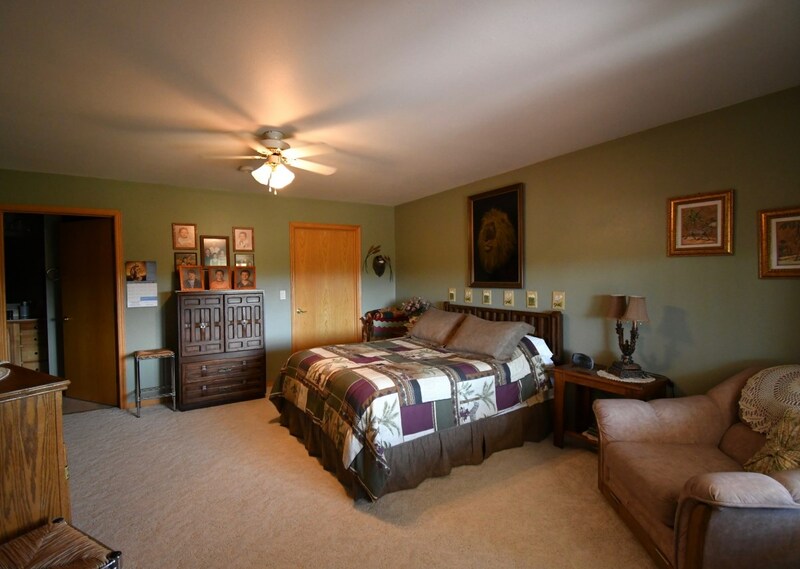 The home was designed and custom built by the current owners in 2002. 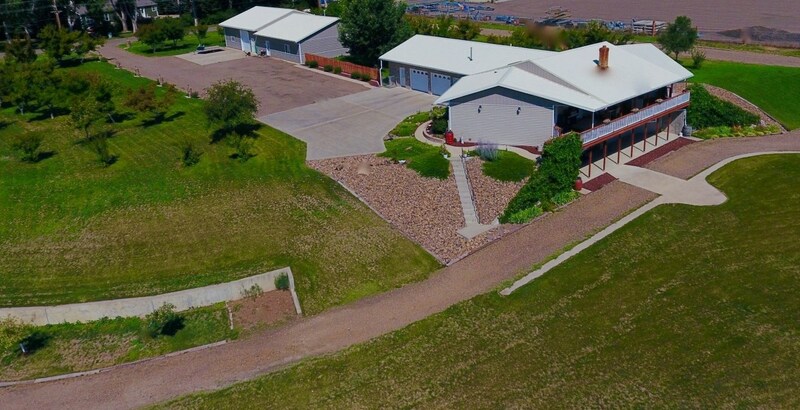 This 4 bedrooms, 3 1/2 bath home has an attached double stall garage, 40x80 finished shop and intricate landscaping spanning over 3 acres. 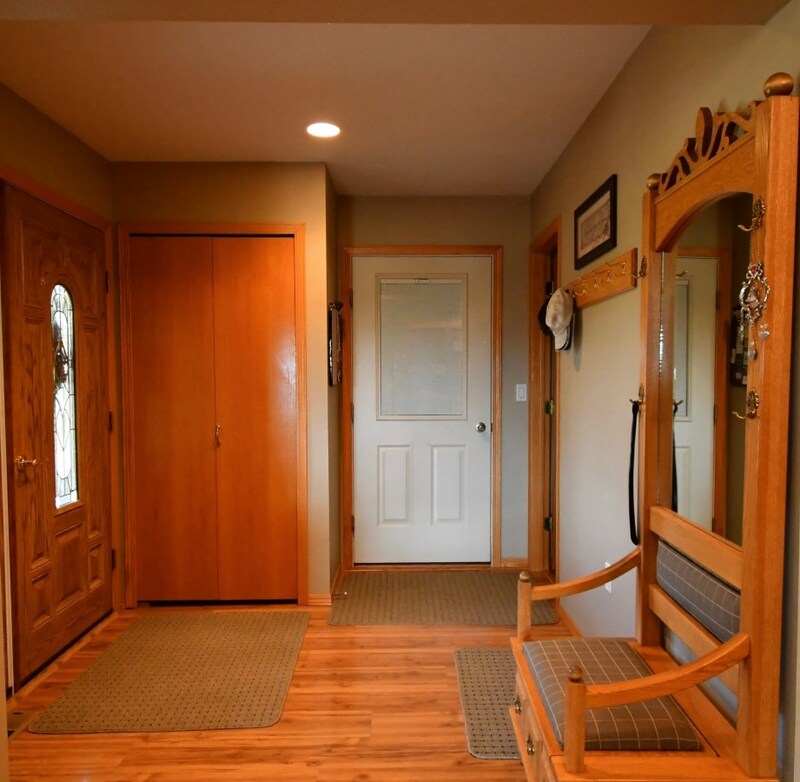 Upon entering the home on the main level you are greeted with an open floor plan, vaulted ceilings, lots of natural light and Hickory wood flooring. 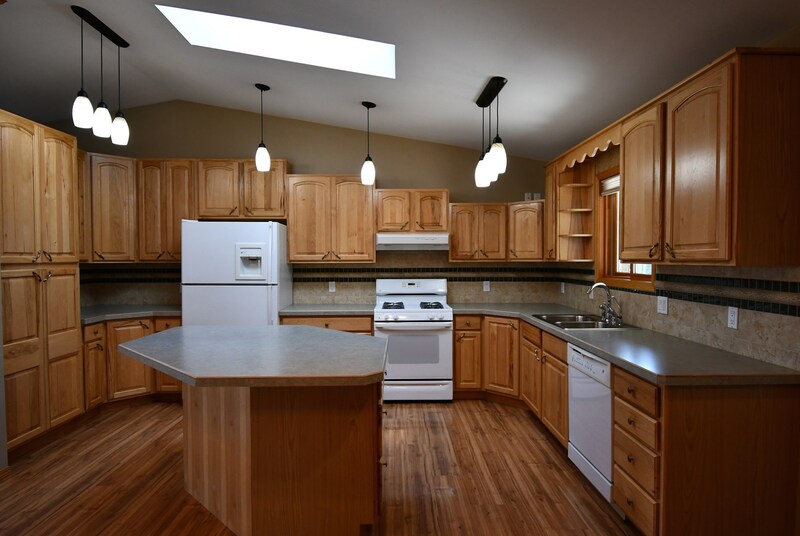 The kitchen features a skylight, an abundance of cupboards and counter space with a large center island and dining area. 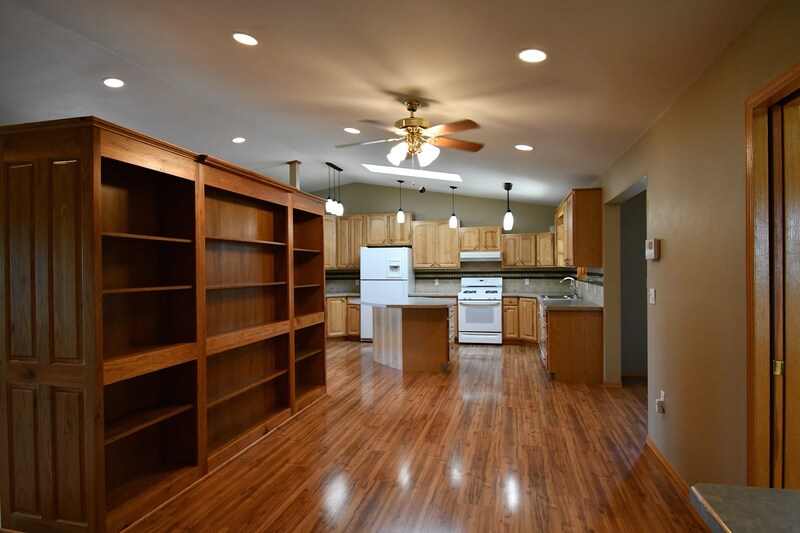 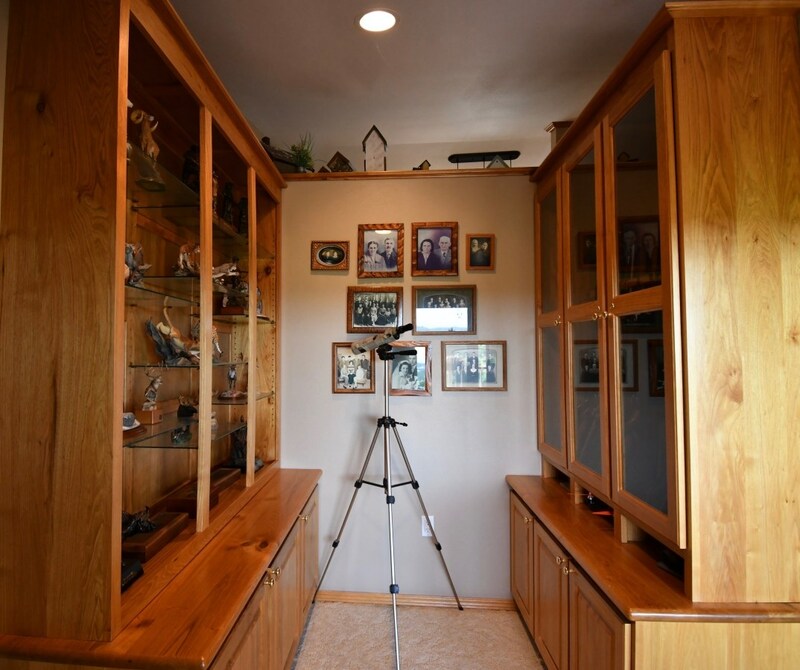 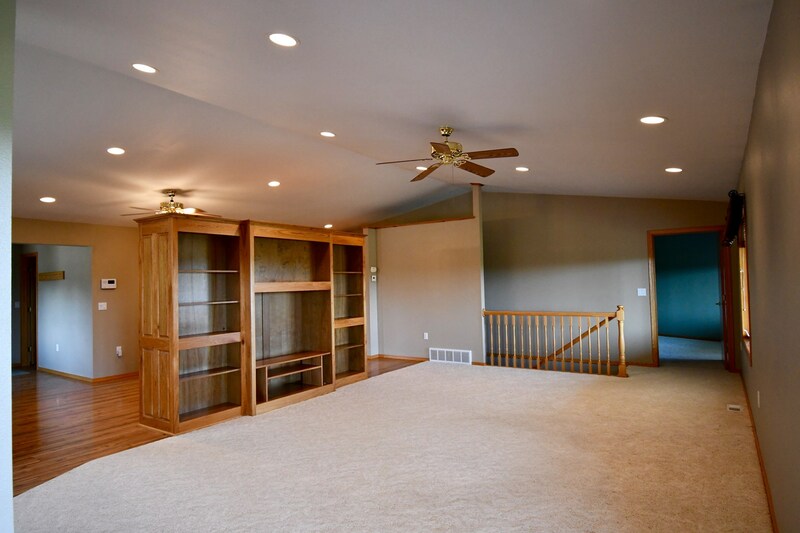 The main level also features a built-in desk/office nook, built in trophy/display case room and a handmade Butternut wood entertainment center/bookshelf that separates the formal dining area from the living room. 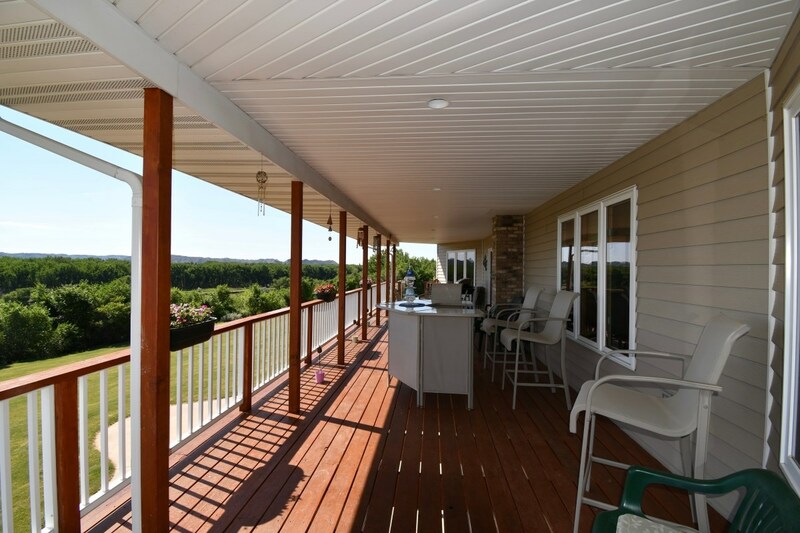 The highlight of the living area is the French doors that open to a covered balcony overlooking the river and Makoshika hills. 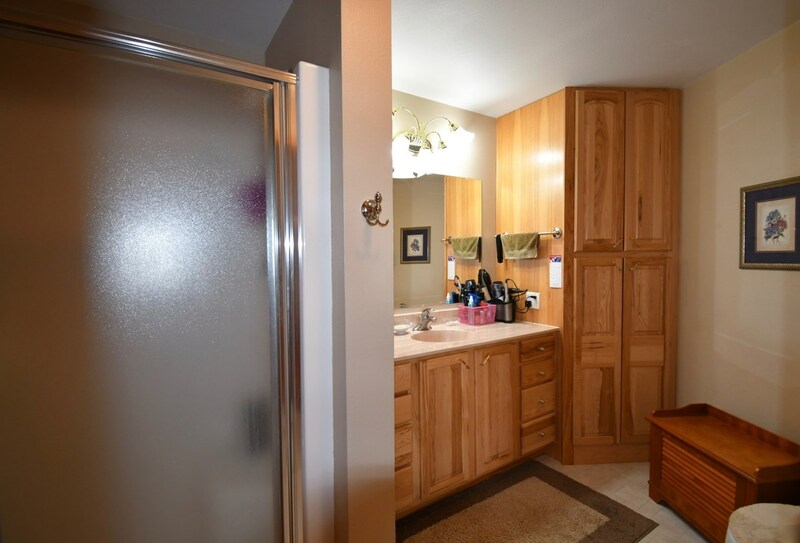 A unique feature of this home is the dual master bedrooms of which each features a large walk-in closets and full private baths. 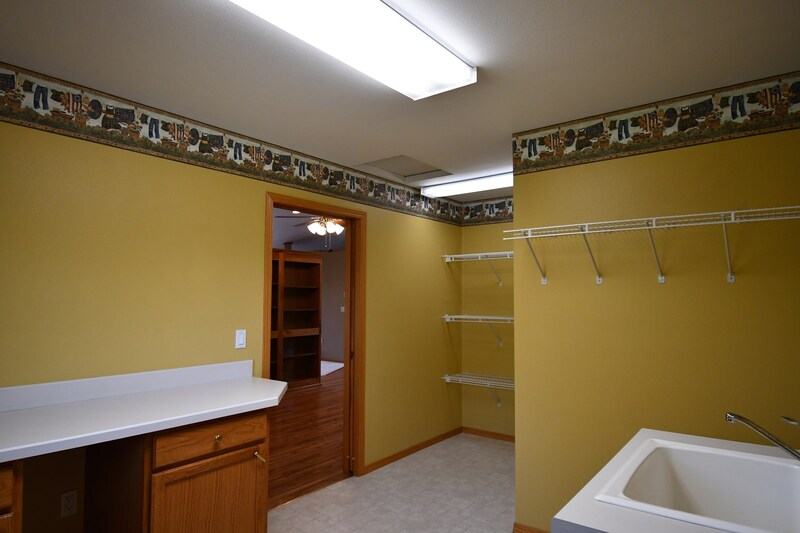 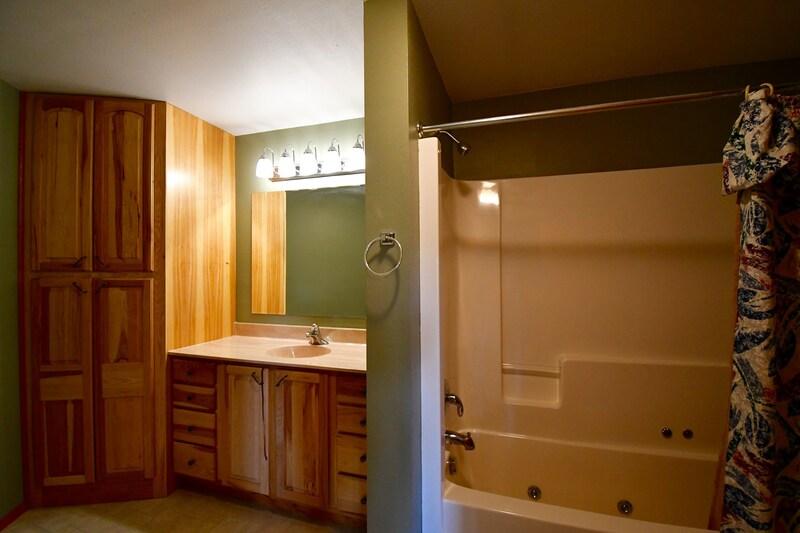 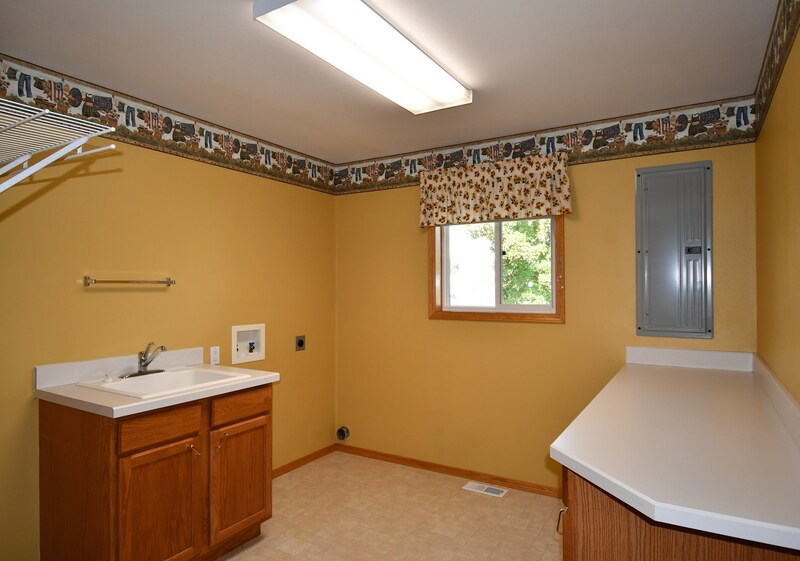 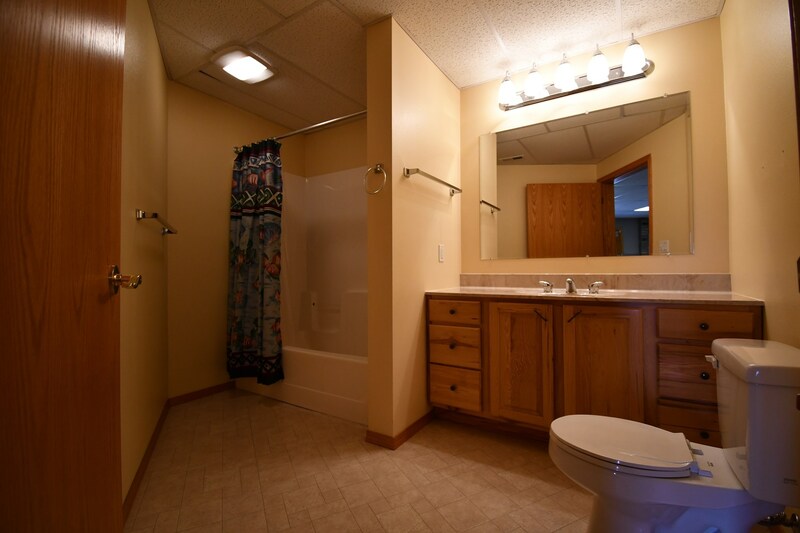 Rounding out the main level is a ½ bath near the entrance and a laundry room. 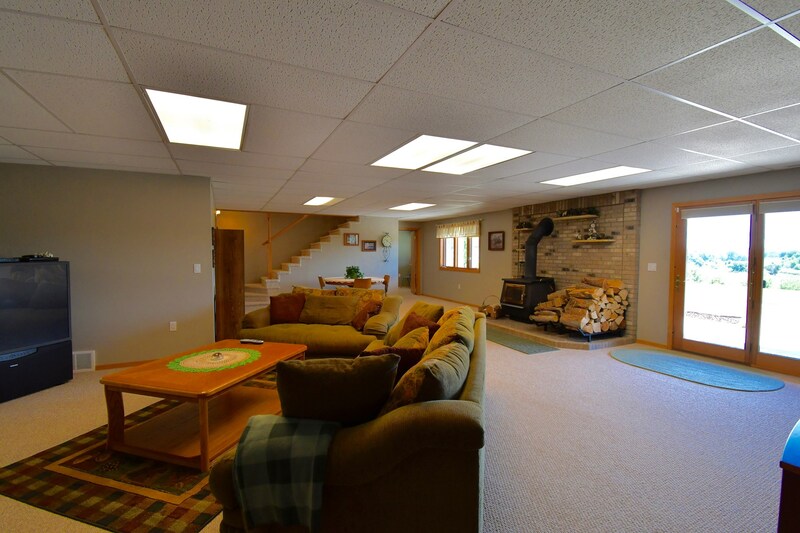 When descending into the walk-out basement you find a huge recreation/family room with wood stove and french doors leading to a covered patio and views of the spectacular sunrises and abundant wildlife. 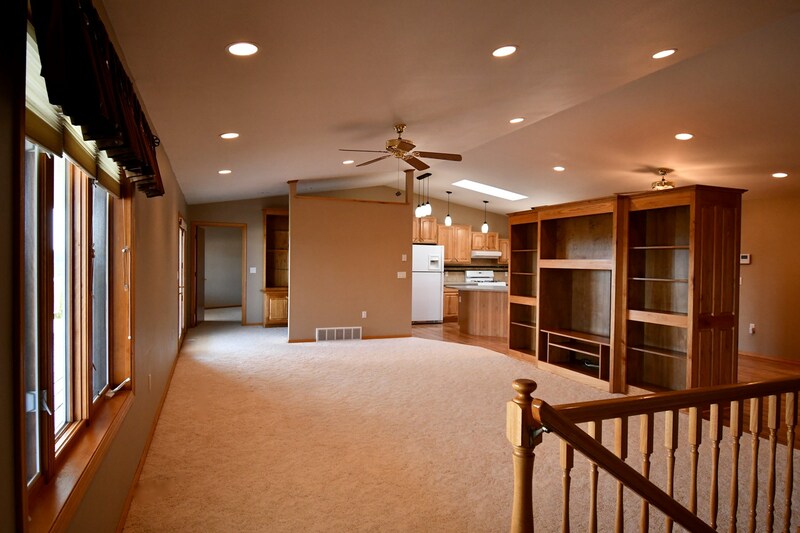 The lower level is completed with two additional bedrooms with large walk-in closets, a full bathroom, utility and storage rooms. 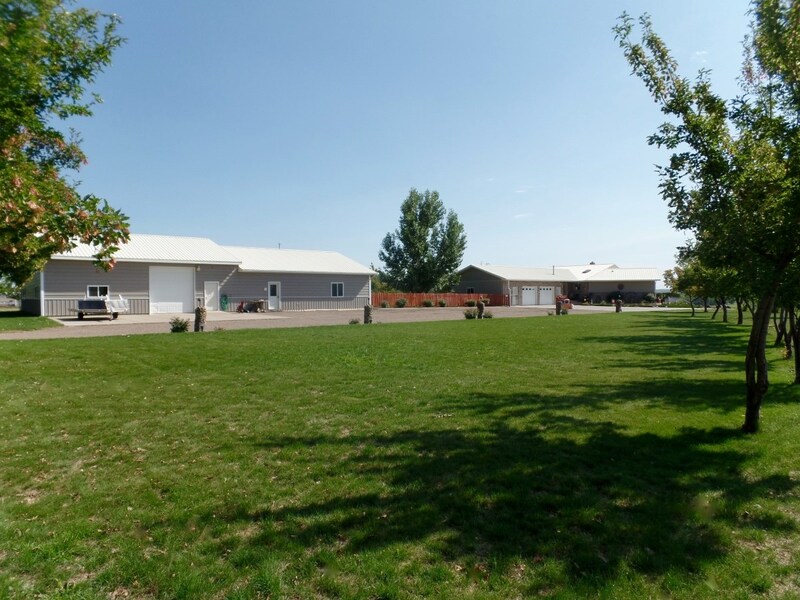 The home has an attached 28 x 36 double stall, heated and insulated garage with doggie door access to their own personal fenced and shaded “pet park”. 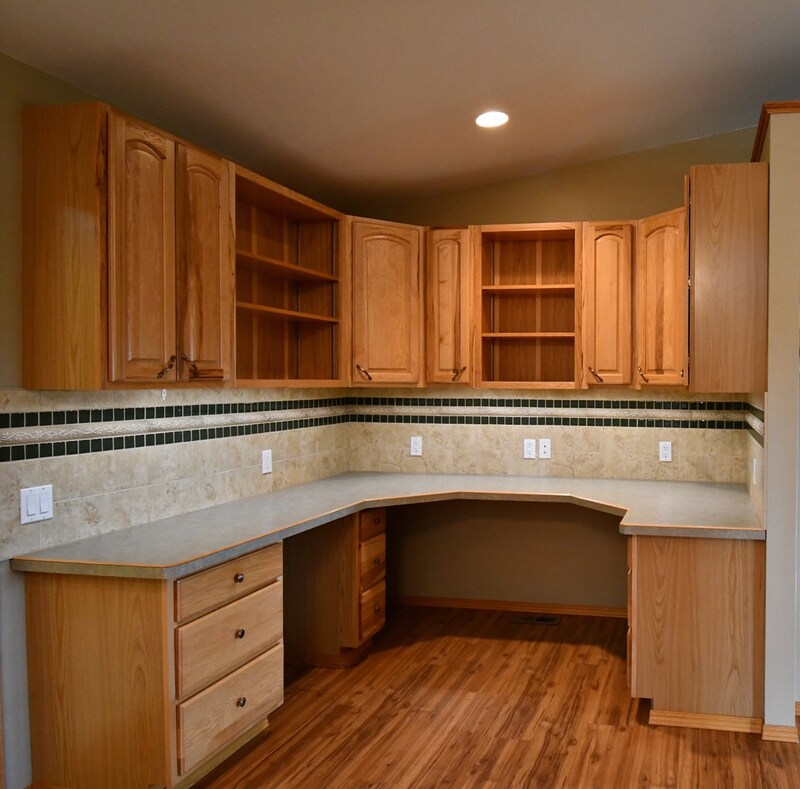 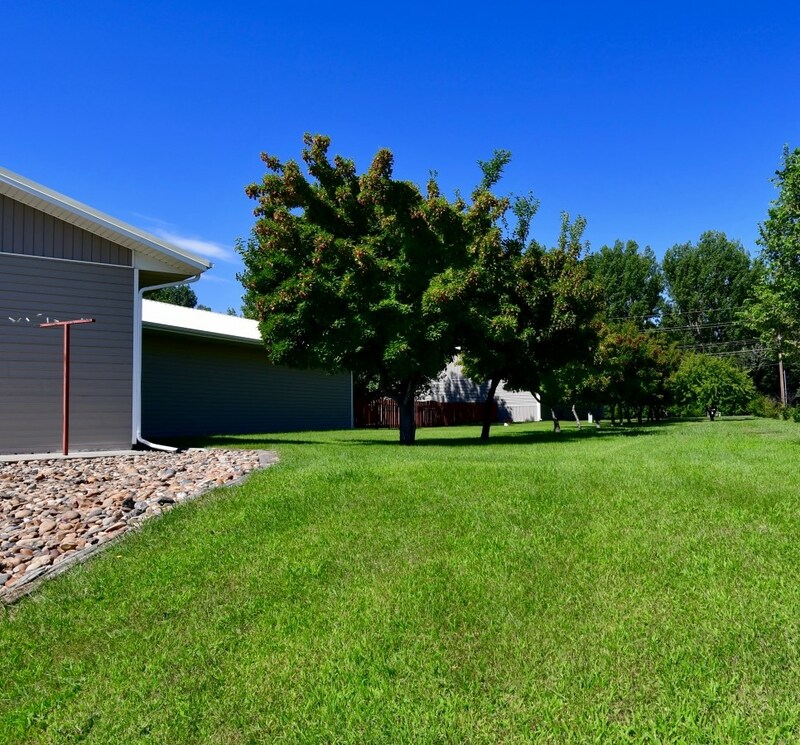 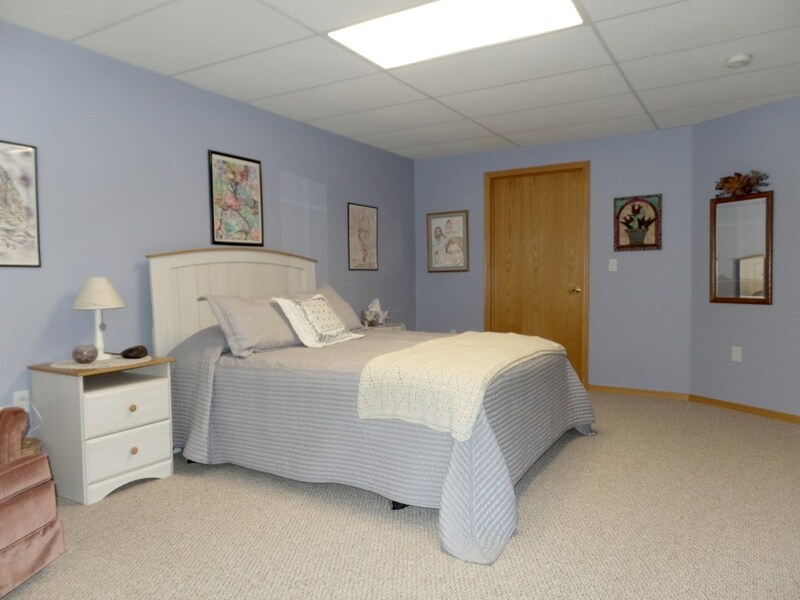 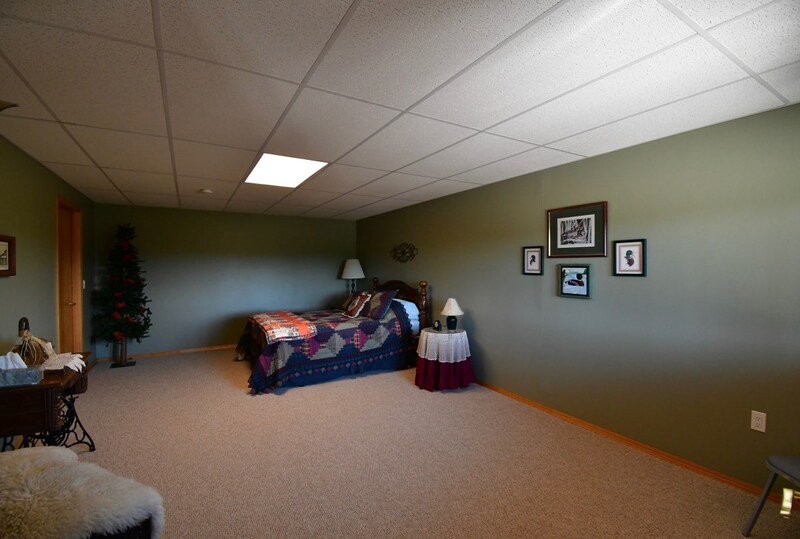 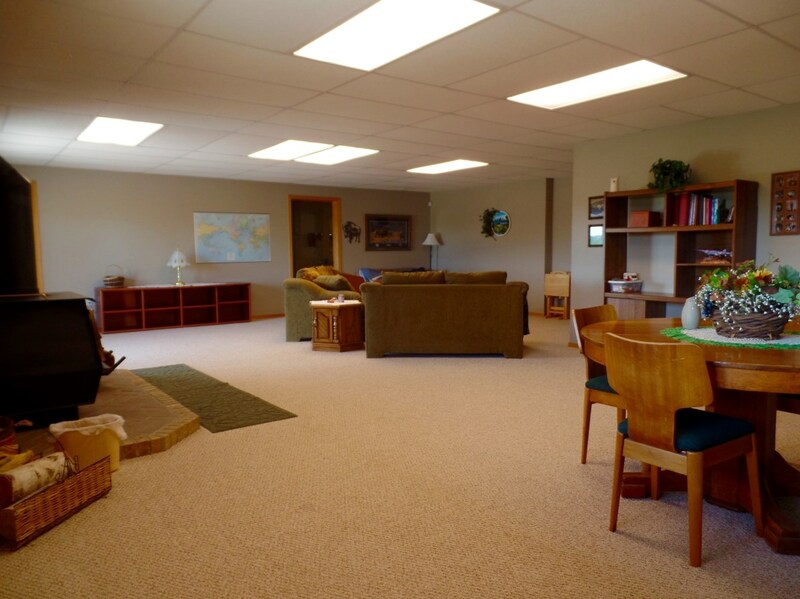 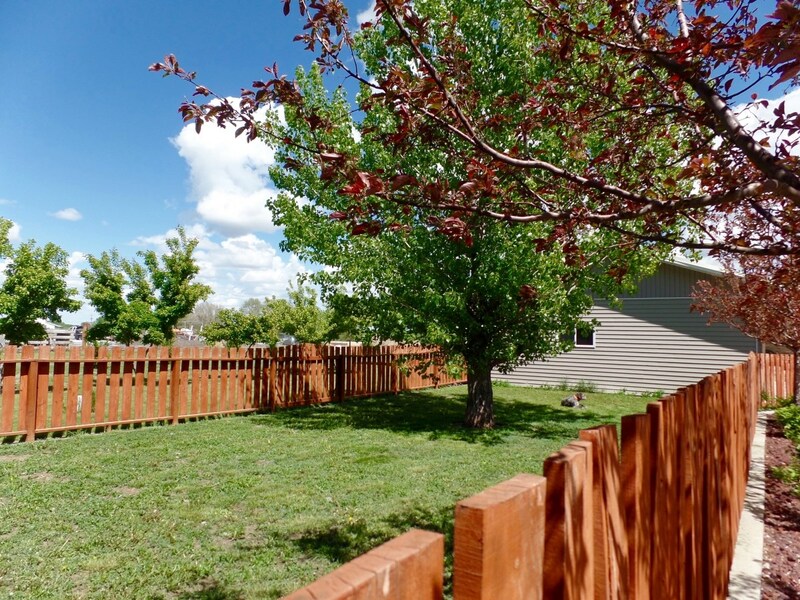 The grounds also feature a 3200 sq’ finished shop with a full bath and is partially heated. 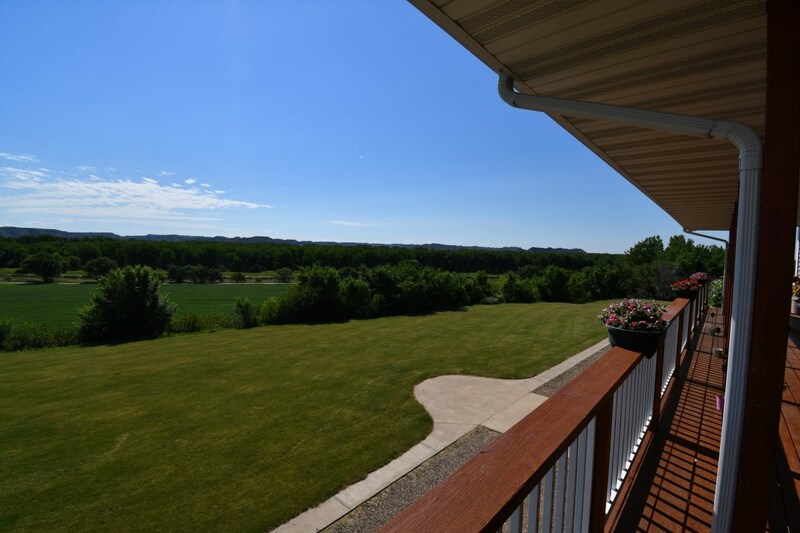 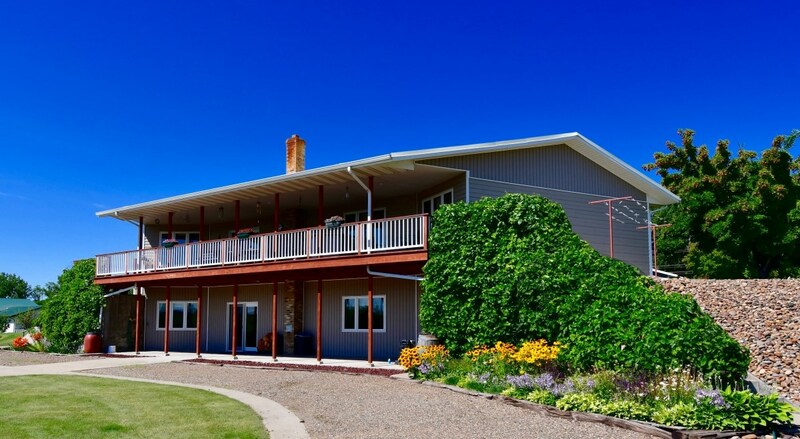 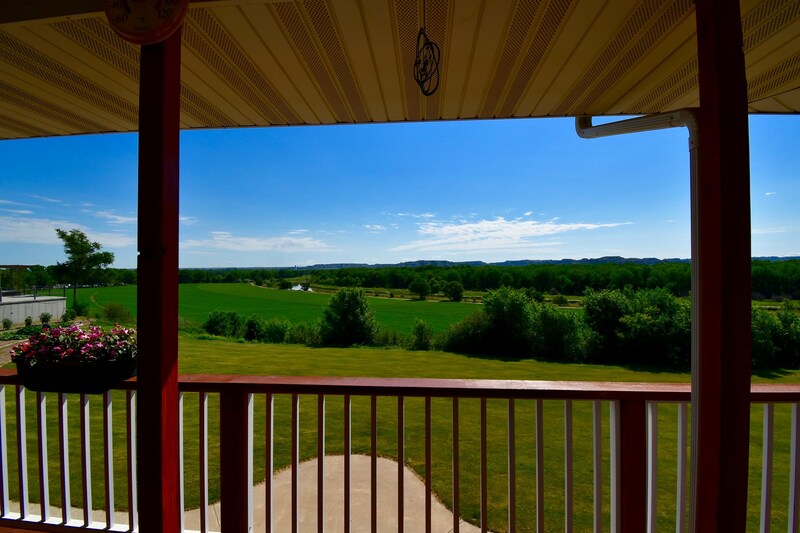 This 3+ acres of land has an underground sprinkling system and an abundance of Amur Maple, Crab Apple and Nanking Cherry Trees throughout the property and just out your back door you will find a garden area and grape vines for you to perfect your own personal vintage wine.